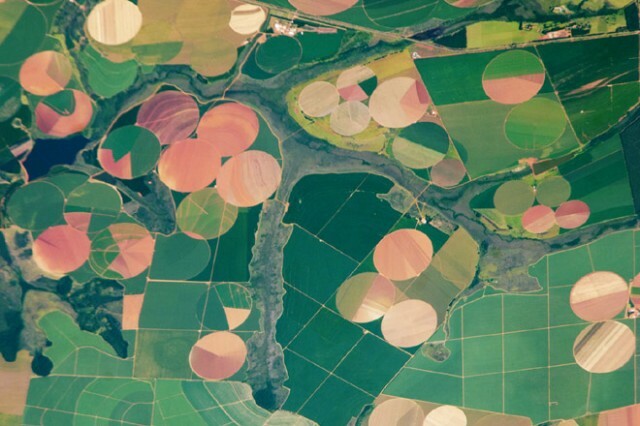 Agriculture is one of the oldest and most pervasive human impacts on the planet. 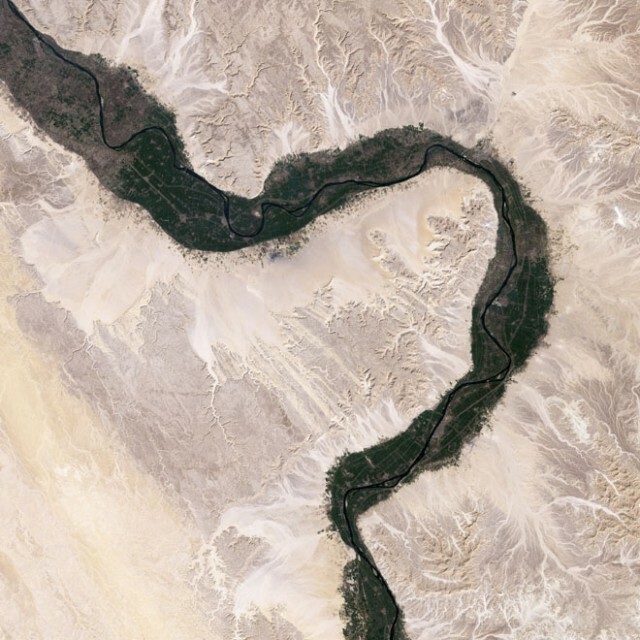 Estimates of the land surface affected worldwide range up to 50 percent. 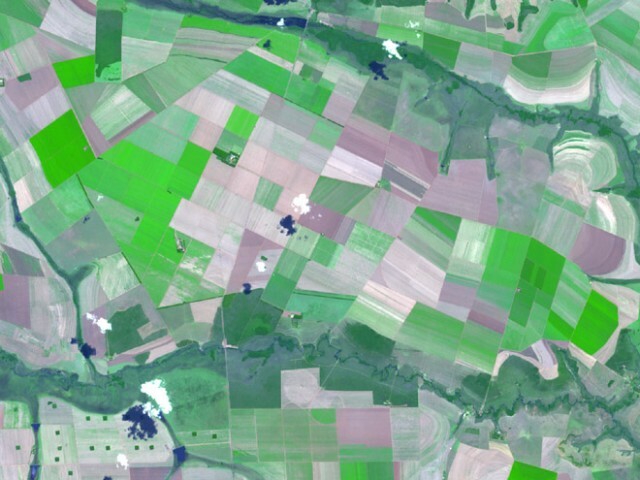 But while driving through the seemingly endless monotony of wheat fields in Kansas may give you some insight into the magnitude of the change to the landscape, it doesn’t compare to the view from above. 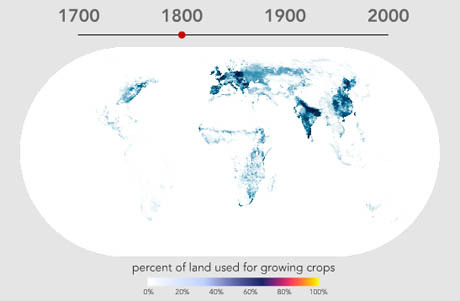 IMAGE: Screen grab showing global agricultural land-use in 1700, from World Cropland, Bill Rankin, 2009. 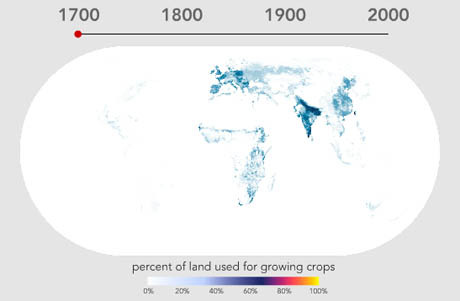 At Bill Rankin’s fantastic Radical Cartography site you can see an animation that shows the intensification and spread of agricultural land-use around the world over the past three hundred years. IMAGES: Screen grabs showing global agricultural land-use in 1750 and 1800, from World Cropland, Bill Rankin, 2009. I could spend hours with these maps: for example, it’s amazing to see that agricultural activity in India in 1700 is as intensive, if not more so, than in the traditional bread-baskets of the Caucasus or the densely populated areas of Northern Europe. The persistent un-farmed patch of France’s Massif Central is also interesting: even the Alps appear to have more agricultural activity. 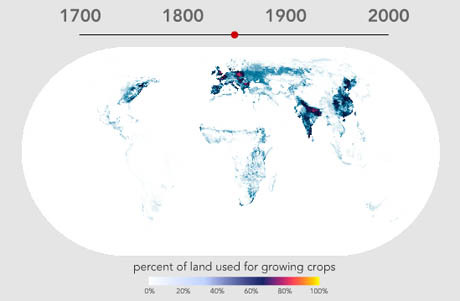 IMAGES: Screen grabs showing global agricultural land-use in 1850 and 1900, from World Cropland, Bill Rankin, 2009. IMAGES: Screen grabs showing global agricultural land-use in 1950 and 1992, from World Cropland, Bill Rankin, 2009. 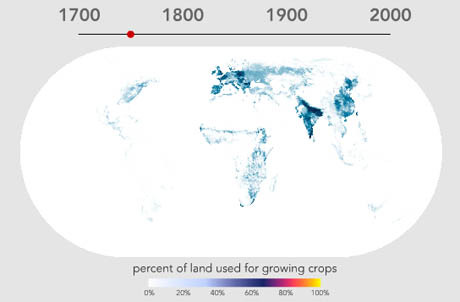 You might be wondering how Rankin knows what percentage of land was used for growing crops in 1700, before much of the world had even been charted, let alone systematically analysed in terms of land-use. 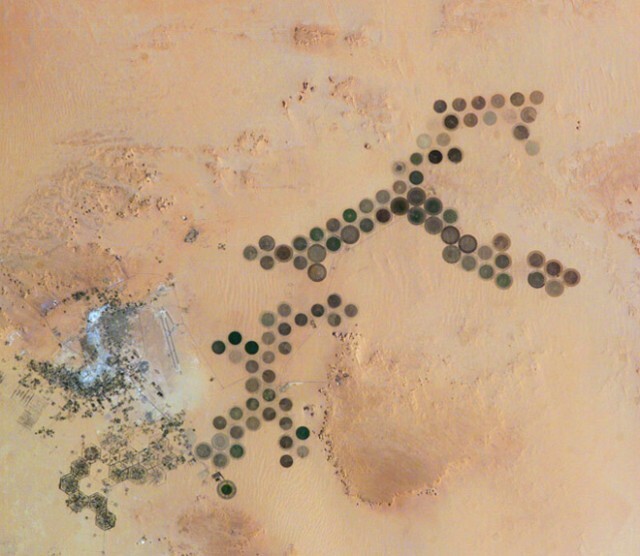 The dataset on which Rankin’s animation is based was developed by Navin Ramankutty and Jonathan Foley, whose methodology relied on an assessment of global agricultural land in 1992, at “5 min spatial resolution” (about 10 km at the equator), by “calibrating a remotely sensed land cover classification data set against cropland inventory data.” They then compiled an “extensive database of historical cropland inventory data, at the national and subnational level, from a variety of sources,” and processed that information through their 1992 land cover/inventory algorithm, in order to arrive at a historical reconstruction. As always, much of the interest in maps like these lies in thinking about what is or isn’t measured—and why. Personally, I’m intrigued by the intensification metric, and the visual implication, as Bill Rankin puts it, that “many agricultural areas are at close to 100% exploitation.” This doesn’t seem quite right: Ramankutty and Foley are measuring agricultural land use (and only at a resolution of about 10 km at the equator), not productive potential. 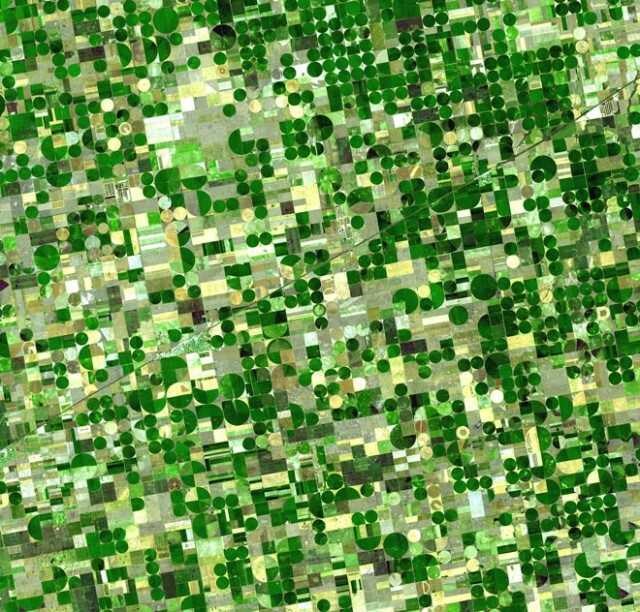 After all, surely an area of land could be solely devoted to agriculture and yet produce wildly differing yields depending on the crops sown and the farming techniques used? 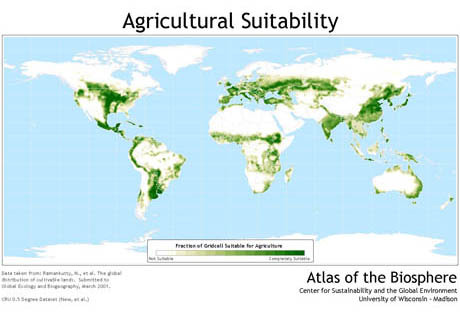 IMAGE: Map showing the suitability of land for agriculture. 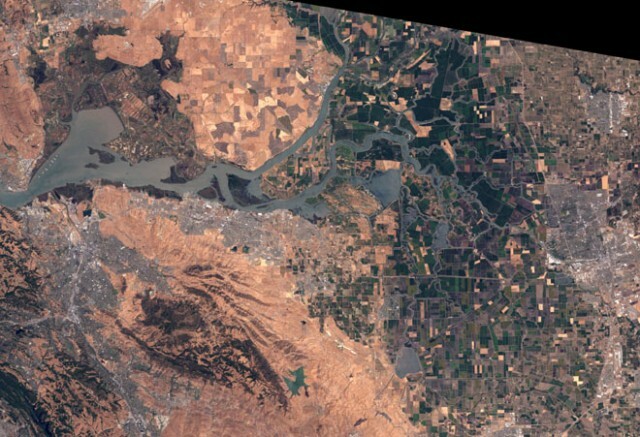 The map (larger view here) is derived from more data sets developed by Ramankutty and Foley, available at the Atlas of the Biosphere. 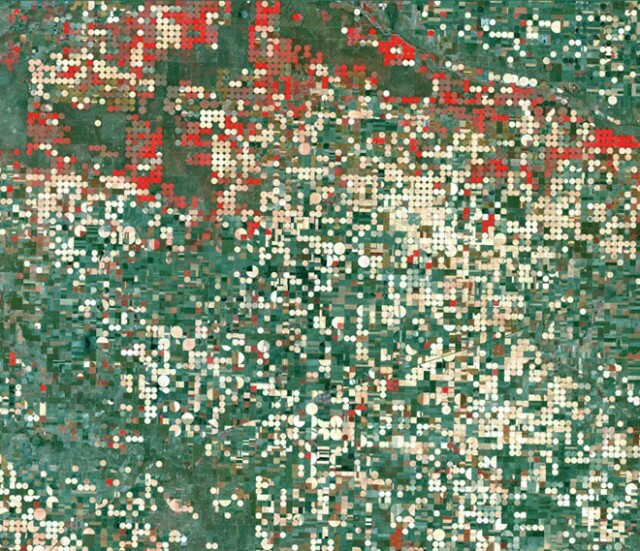 Elsewhere, Ramankutty and Foley have also collaborated to map agricultural potential, based on “the temperature and soil conditions of each grid cell.” Somewhat implausibly, since agriculture both shapes and is shaped by human civilisation, the suitability rating ignores human inputs—urban sprawl, artificial irrigation, topsoil creation—altogether. 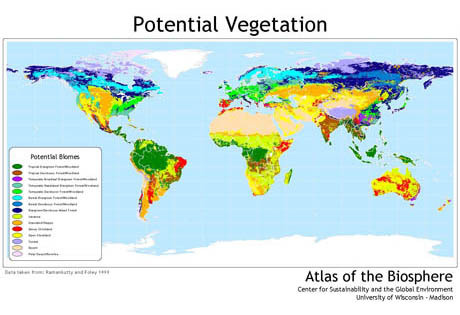 IMAGE: Map of potential vegetation. The map (larger view here) is derived from more data sets developed by Ramankutty and Foley, available at the Atlas of the Biosphere. It is an alternate surface of the earth, carefully surveyed and classified by a human civilization that could not have existed in order for it to be a reality. Specifically, Theobald used existing land use data to apply scores at a scale of 30 metres. 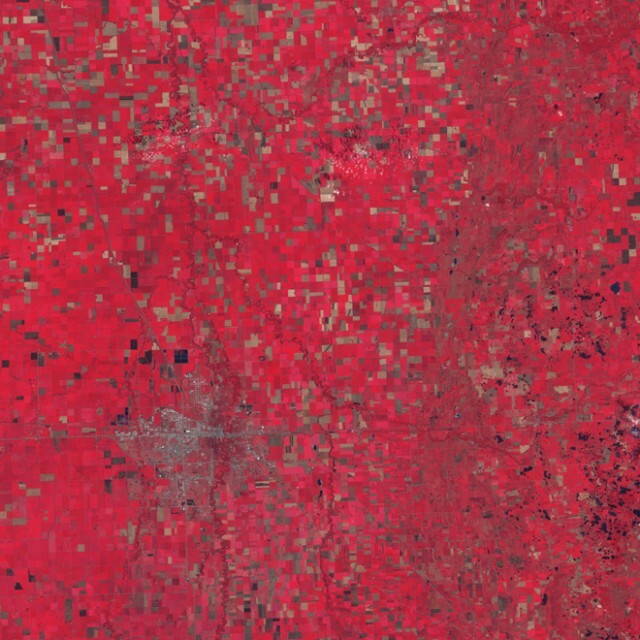 Urban/built-up areas, roads and cropland were assigned a score of “0.” Natural areas (i.e. forests, grassland, wetlands, etc.) were assigned a score of “1.” Roads and rural development negatively impacted the scores of adjacent areas. 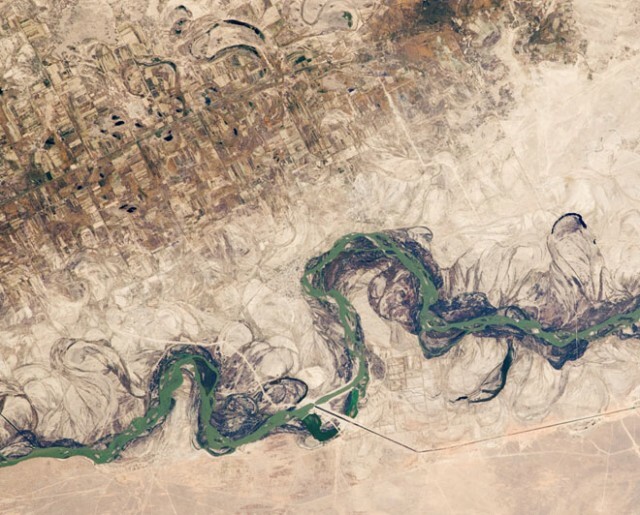 The project seems flawed on several levels (it is somewhat incredible that Owens Valley, with its hijacked river and poisonous lake-bed, could receive the “highest naturalness” scores under any rubric), but the paradox of its premise is fascinating—that a pure form of nature can be carefully located and recognised as such by humans whose activity otherwise renders impossible its very existence. Theobald suggests that his system is a useful tool for conservationists seeking to prioritise their efforts. 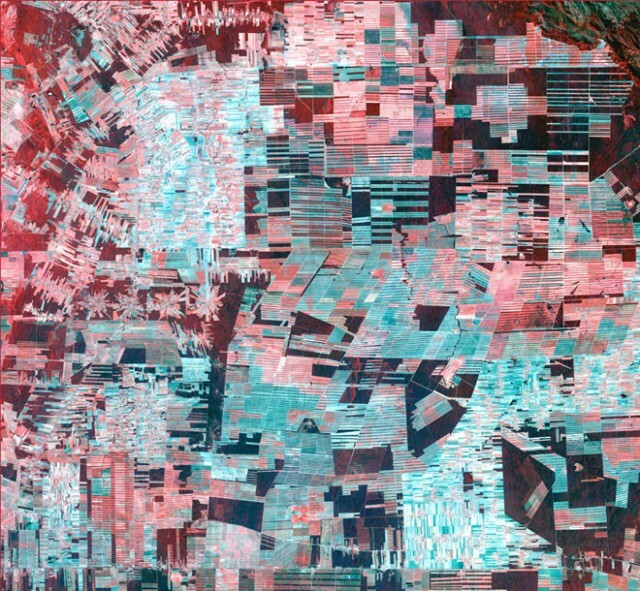 To me, however, it is more interesting as a geographic expression of impossible nostalgia—the land-use database equivalent of medieval monks calculating how many angels could dance on a pin. This is to be put in parallel with Jared Diamond's book: Guns Germs and Steel: The Fates of Human Societies that explain the evolution of human socities from a geographic/food point of view, that would in a way generate, according to Diamond, social and cultural diversities. An eye opening book on the interaction between environment and human societies. Just one comment as well about the title: I don't think any percent of land and atmosphere is natural anymore. We've totally changed the quality of air (not saying climate) through human activities at least since the industrial period (but in fact much earlier, agricultural, etc.) and we could also consider the change of perception in landscape through communication electromagnetic waves. 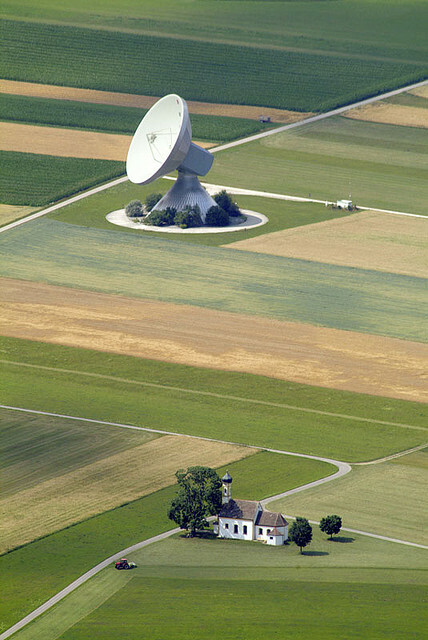 A large part of the landscape has now become a sort of "invisible urban territory" though electromagnetic networking. Interesting study by MVRDV, The Why Factory and Stroom Den Haag. A lot has been said (through) on Urban Farming, but many don’t consider their feasibility. I´m not being pessimist (I grow some of my own vegetables and herbs), but I think that urban farming goes more in the direction of the last phrase of the video: “could it (urban farming) help bringing some agriculture into the cities to bring us closer to our food again?”. Cities may be more energy-efficient than the countryside, but we can radically enhance that efficiency with existing and achievable technology plus a little imagination, making cities carbon neutral and all but self-sufficient. 1 Build intelligently Construction of new buildings consumes materials and creates massive carbon debt. Wherever possible, existing stock should be refurbished and retrofitted using bioarchitectural techniques and recycled and sustainable materials to enhance energy conservation, reduce water consumption, and maximise use of rainwater. Turn office buildings into the equivalent of high-tech beehives; shopping malls into jungle bazaars; point blocks into pinnacles dripping with vines and pocket forests. 2 Go Nuclear Present experience shows sustainable sources of energy - from buildings equipped with solar panels and wind generators to plants generating biofuel and electricity by digesting garbage - will not satisfy the energy demands of large cities. A new generation of compact long-life nuclear power plants such as India's thorium reactor or South Africa's pebble-bed design will plug the power gap and produce small quantities of waste that, unlike carbon dioxide generated by oil- and coal-fired plants, can be safely stored in vitrified form. 3 Stop using fossil fuels Cities are at present vulnerable to the smallest interruptions in oil and gas supply. The first step in cutting this dependency should be a ban on private car ownership in metropolitan areas. Even a sprawling city like London can be comfortably navigated by walking, cycling, and use of public transport - powered, like delivery vehicles servicing businesses and homes, by batteries, biofuels, or hydrogen fuel cells. The great tidal flows of commuters could be reduced by rezoning commercial areas for residential use and introducing workshops and offices into residential areas, as in the human-scale, mixed-use street plans of medieval cities. At present, 30 per cent of London's carbon budget is consumed by commercial aircraft flights. In the future, all flights should use only biofuels produced by farming GM microalgae that mop up nutrients from sewage and produce ethanol and lipids. Even without genetic modification some strains of algae already yield more than ten to 20 times more biodiesel than rapeseed; the most efficient grow in saltwater, so would not compete for potable water; and fuel production powered by photosynthesis would be carbon neutral. 4 Embrace GM Parking structures and unwanted office and residential tower blocks could be converted to vertical farms where high-value GM crops, produced by open-source research rather than agribusiness, modified for perennial growth and maximum productivity, could be grown year-round using advanced hydroponics systems (drug dealers have already embraced this technology to produce crops of GM marijuana in ordinary houses). Walls and streets would be turfed with tough GM grasses and sedges; these, and thick plantings of trees lining roads, would absorb carbon dioxide and provide equitable microclimates. 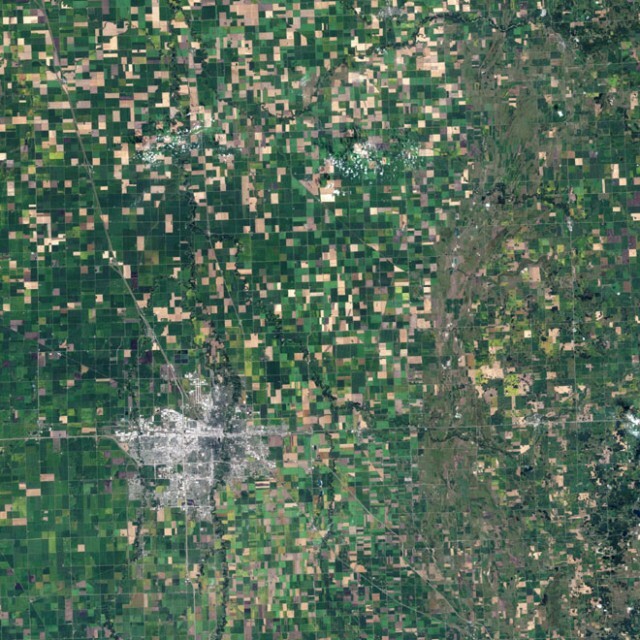 From the air, the ideal green city should resemble Mayan ruins poking out of a lush forest. Under the canopy, there'll be densely populated but diverse and vibrant streets humming with every kind of human life. Utopian? You bet. But unless we get a lot smarter very quickly, we'll get the future we deserve: sweltering resource-poor mega-favelas salted with the high-security enclaves of the hyper-rich. Time to choose. Paul McAuley is a biologist and multi-award-winning science-fiction author. His new novel Gardens of the Sun is published by Gollancz. 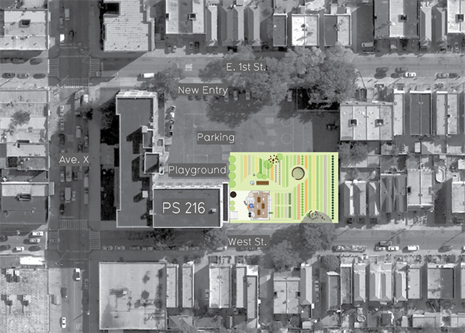 Work AC, in collaboration with Edible Schoolyard NY and the Alice Waters’ Chez Panisse Foundation, is designing a new schoolyard for PS216 that will offer the young New Yorkers a different learning experience. 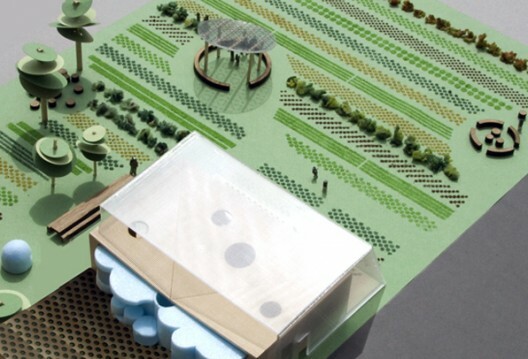 The Edible Schoolyard is designed as a series of interlinked sustainable systems where the building will produce energy and heat, collect rainwater, process compost and sort waste with an off-grid infrastructure. More images and more about the school after the break. 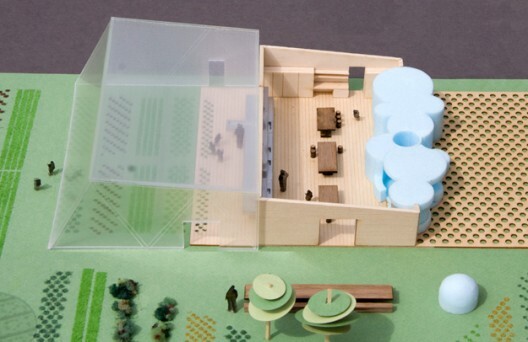 The school includes a kitchen classroom and mobile greenhouse where children are brought together in a learning environment that also promotes eco-friendliness. 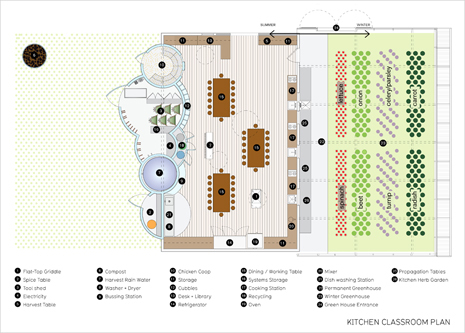 The roof of the kitchen classroom, a room that provides the facilities for up to 30 students to prepare meals together, channels rain water for reclamation. The mobile greenhouse extends the growing season by covering 1600sf of soil in the colder months and gardens will allow the children to care for plants. 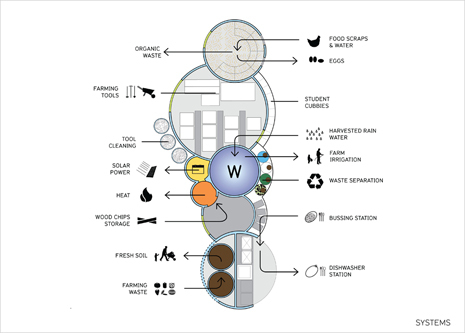 A systems wall, a series of spaces that include a cistern, space for composting and waste-sorting, solar batteries, dishwashing facilities, a tool shed and a chicken coop, rests on the opposite side of the yard. The project is a great way to introduce sustainable methods into children’s lives at an early age. The “edible” element will definitely pique children’s interests and help the next generation realize the importance of the eco-friendly movement. Evidemment, et ces raisons politiques ont induit des choix. Aujourd'hui, la plupart de la viande vient d'Amérique à des prix qui sont artificiellement très bas. Parce que cette viande provient de très grandes exploitations qui produisent massivement et qui, pour beaucoup, ont des coûts sociaux et environnementaux très faibles. Notre alimentation très carnée s'appuie aussi sur une production qui induit un accaparement de plus en plus important des terres dans ces pays et concurrence directement l'agriculture vivrière. Au Brésil, il y a ainsi des millions de paysans sans terre. Article from the Guardian by John Vidal (16th June 09) about temporary "grow gags" being moved guerrilla style across London to provide food for city dwellers. The Square Mile, capital of commerce and the site of Britain's most expensive real estate, could soon host some of its first temporary allotments with giant "grow bags" set up on building sites. The City of London, one of the few authorities not to have formal allotments, wants some of its 9,000 residents to use the spaces to grow fruit and vegetables. The authority has only 22 acres of open space, mostly in old burial grounds and small squares, but the recession has left many building sites vacant. "There are plenty of temporary sites awaiting development and there is no reason why, if carefully done, they could not be turned to other uses," said Sue Ireland, head of open spaces in the City. "We are trying to identify a site on the edge of the Square Mile that would be vacant for between 18 months and two years. Grow bags are one possibility. They could be butted up together and moved as and when the developers need to start work." The grow bags idea came from a music festival where she saw huge sandbags being moved around by fork-lift trucks. "I was thinking how flexible they could be. Grow bags would allow people to grow carrots and peas. You would have to secure the site and give developers the confidence that the bags could be moved. But if the right site came up, I am sure money would be available." 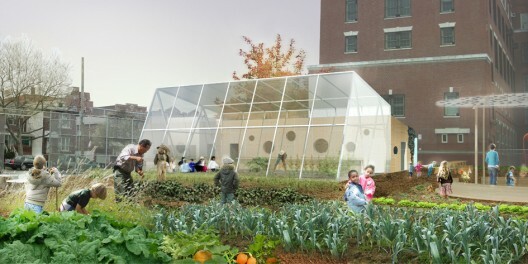 The idea of using temporary sites to grow food is not new. In New York, community gardeners have moved from one site to another for more than 30 years. The Commission on Architecture and the Built Environment (Cabe) calculates that Britain has nearly 74,100 acres of vacant or derelict brownfield land and other unused public space that could enhance cities or help communities. "Other cities have guerrilla gardens, why not guerrilla allotments?" says Sarah Gaventa, director of the Cabe Space, the government's official adviser on public space, who is a resident of the City of London. 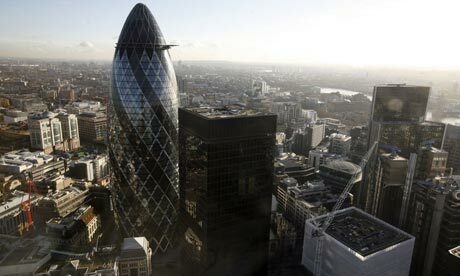 "There is lots of dead space in the Square Mile. It's ridiculous not to use it for local food production. Chris Baines, an ecologist and author, added: "Land 'in limbo' is an incredibly valuable resource. Its temporariness is its strength. It allows you to be more innovative because you know it is not going to be permanent." The City of London initiative follows dozens of other grassroots projects to grow food in cities where allotment space is at a premium and there is growing demand for local food. Yesterday it was revealed that the Queen had turned over an allotment-sized plot for growing vegetables and fruit in the gardens of Buckingham Palace. Many inner-London boroughs have waiting lists for allotments that can be decades long and there is a reported shortage of more than 200,000 allotments across Britain. Boris Johnson, mayor of London, and Rosie Boycott, chair of London Food, have recently launched a scheme to turn over 2,000 pieces of land in London into space for food growing by 2012. Thirteen organisations, including British Waterways, councils, schools, hospitals, housing estates, and companies have pledged to make land available for community gardening schemes. Both the National Trust and the Royal Parks have agreed to provide allotment space. But the City is way behind the competition. The UN estimates that 15-20% of the food produced in the world now comes from 800 million urban and peri-urban farmers and gardeners in cities"